Every waking hour, I ingest water. Not always in its purest form, but near enough. Energy is important and right now (and rightly so), carbon is capturing headlines. But water is fundamental to our livelihoods. The UN has designated 22 March World Water Day: “a day to celebrate water”. And why not? Never mind that it’s essential to all life forms. For modern living, it’s a necessity: we need 10 litres of water to make one sheet of paper; 182 litres to make a kilo of plastic. We’re not about to run out of seawater, but what about drinkable freshwater? A glance at the UN’s water statistics reveals the urgency of our situation. In developing countries, 90% of wastewater flows untreated into water bodies. An estimated 1.8 billion people worldwide drink water contaminated with faeces. By 2030, 47% of the world’s population will be living in areas of high water stress. In 60% of European cities (population > 100,000 people), groundwater is being used faster than it can be replenished. As the primary source of drinking water worldwide, groundwater is vitally important. In fact, groundwater comprises 97% of all global freshwater potentially available for human use (the UN don’t qualify this definition, but one can probably assume that 97% of all drinking water is groundwater – further enlightenment on this is welcome). Moreover, our use of groundwater is increasing by 1-2% per year. If we look west to the US then we reach California – a drought stricken state with, according to senior water cycle scientist Jay Famiglietti of the NASA Jet Propulsion Laboratory, only one year of water left in its reservoirs and rapidly disappearing groundwater. Dwindling water resources are a global challenge. However, at present (again, this is UN data), 54% of the world’s population live in cities. By 2050, this figure will approach 70%, with 93% of urbanisation occurring in developing countries. If you reduce the problem to securing clean water for city dwellers, then it becomes markedly more manageable – at least, if you have big budgets. London is currently tussling with the proposed Thames Tideway Tunnel (TTT), a £4.2 billion (at 2011 prices) “super sewer” designed to contain overflows of sewage, currently in the order of tens of millions of tonnes a year, and hence prevent the pollution of the river Thames. Although it will help future-proof the capital against climate change, the TTT won’t do much else than divert sewer overflows: a big spend for one single solution. Moreover, its carbon footprint is not small. A shortcoming of some climate change adaptation interventions is that, through their production and often, operation, they may only amplify the root of the problem. If we want value for money, then why not demand more than just one benefit? One stone, but at the very least, two birds. Consider combined heat and power (CHP) plants, which generate two energy types, at improved efficiencies of conversion, from a single fuel. Do we therefore need one pipe network for drinking water, one for waste water and one for stormwater? Plus an array of energy intensive pumps? Urban floods are invariably caused by runoff from impermeable surfaces – roofs, roads and pavements. 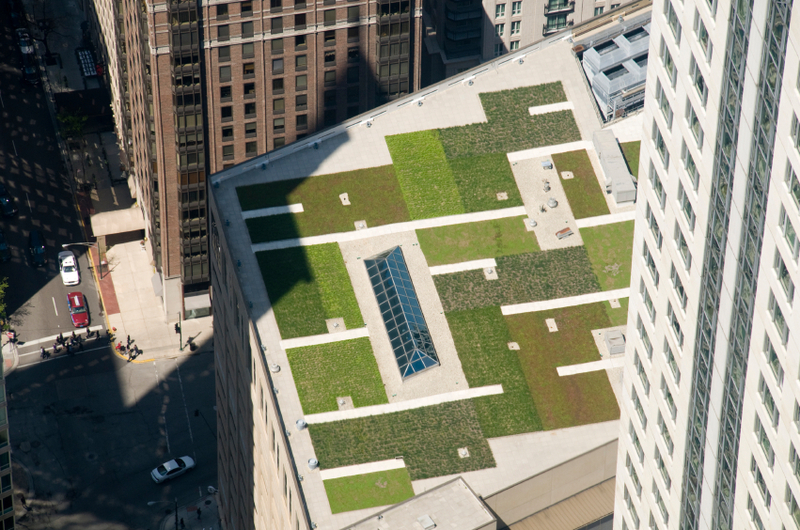 A carpet of urban greenery can both trap and, via the plant root network and soil media, decontaminate runoff, removing the need for a centralised stormwater system. The grey city can grow green. For cities to be self-sufficient and resource-smart, we can’t let stormwater dissipate into drains. Drinking harvested rainwater is problematic, but irrigation of city greenery – not only garden plants but also, fruit and vegetable crops – is not. Plants are truly multi-functional. Their benefits include enhancements to human health and well-being, as well as mitigating the urban heat island effect and promoting biodiversity. This is the Blue Green Dream paradigm: the smart use of plants, in concert with the local environment and manmade systems such as storage tanks, to sustainably manage water resources and also, deliver myriad urban benefits. The Blue Green Dream – a multi partner, Climate KIC funded, Imperial College led project – is harnessing ecosystem systems to achieve climate change resilience. For further information, see the project website or contact the project manager, Dr Karl M. Smith. Previous Previous post: Time to Act climate march – what was missing?